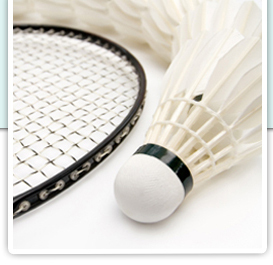 Getting into 'the zone' or playing your best badminton is something which anyone can train themselves to do. There are a number of mental tips including word association, visualization and simple preparation which you can assimilate into your routines to improve your performance. Many coaches would summarize the key elements of mental preparation for optimal performance as relaxation, focus and confidence. The acronym B.A.K.E. is a good one to help remember what is required. 1. Belief - This is associated with confidence. Note that this is confidence rather than arrogance. Confidence comes from a belief in your training methods, a belief based upon what you have achieved and feel you can achieve, and a self-perpetuating belief that comes from reinforcing your own self-confidence. 2. Ability - You must have the ability to perform. Having read the section on fitness, you will know that many of the elements that go into making the complete player must be worked on. You may have been blessed with quick reflexes from a young age or be naturally tall or quick. To achieve your full potential, you must work on your whole game and address any areas which need improvement. 3. Knowledge - This includes knowledge of yourself, knowledge of your opponent and knowledge of your environment. Are you playing to your strengths? Is your opponent prone to errors in longer rallies? Is the shuttle flying too fast? You must recognise these things quickly and adapt your game where required. 4. Execution - Putting all of the above into action or executing them is the final piece of the puzzle. You need a cool head (focus) to make the best of your belief, ability and knowledge. This will depend upon your ability to concentrate and maintain that concentration even under pressure. Visualisation is a powerful mental tool. It works well especially for 'closed skills' where there is no immediate interaction from other parties. An example of this is the serve. You can build confidence in the skill by rehearsing it in your mind. Go over the key elements required to execute the stroke in your mind. See yourself performing these faultlessly. See the outcome in your head and feel the confidence gained from serving well. Take this onto the court and practice the shot as you saw it in your head. This technique can be used in conjunction with proprioception. Proprioception is the sense of how your own limbs are oriented in space. Tip: Try serving with your eyes closed to gain a better awareness of your body and how you hit a stroke. Not during a game though! Achieving the optimal state to perform in sports is the goal of most athletes. There are many factors which can contribute towards this 'flow', both mental and physical. These include the challenge-skill balance, action awareness merging, clear goals and feedback, concentration and mental state. The first, the challenge-skill balance, requires that the challenge before the athlete is stimulating but not overwhelming. The player must believe in themselves in order to rise to the challenge. Conversely, a situation which is not sufficiently challenging will not produce the best from a player. Action-awareness merging is achieving a state whereby you are able to become one with your game. You will not be distracted by outside influences or be overly concerned or critical about any mistakes which you make. Your game will flow in an effortless fashion. You will have clear goals, knowing exactly what you want to achieve. Although the overall goal maybe to win a tournament or a match, this must be broken down into the steps which must be taken to achieve this end i.e. each point of each game. All feedback received will be taken in and used constructively. A state of complete mental concentration is achieved along with a sense of control over themselves and their situation. Importantly there is no fear of failure, just a sense of calm focus. You can ensure the optimal level of arousal by working out what type of player you are. If you are the type of player who plays best when you are psyched up, try to get into this mindset before the game. If the game is not sufficiently challenging, maintain focus by trying to win by a certain margin. If you are a player who performs best when you are calm, use deep breathing and visualisation techniques to relax and focus. Develop a plan to cope with the challenges you may have during a game. Self-encouragement before and during a game will have a huge impact on your performance. Always use clear-cut positive language. 'I will hit an accurate smash' is better than 'I will try to hit more smashes'. Motivate yourself by looking forward to the match or tournament and set yourself a goal or goals that you wish to achieve. In addition, proper preparation will mean you are confident in your readiness to perform. Focus on your game and your strengths. Ensure you play your game. Although you will need to be aware of your opponent's strengths and possibly adapt the way you play, you should retain the strongest elements of your own play and impose them on the game.